Scansite3D uses the highest quality optical metrology systems for the three-dimensional coordinate measurement of components. Our structured light 3d scanners, and photogrammetry systems, manufacutred by GOM/ATOS and Aicon3D/Breuckmann, are the finest systems available. Many older types of aircraft are in service for which no CAD files exist. 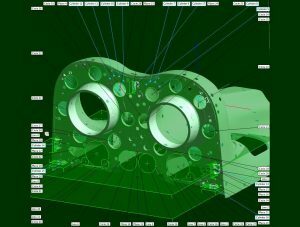 Scansite 3D specializes in 3D scanning and CAD creation to generate legacy CAD files that will import seamlessly into your CAD software. The Fairchild Republic A-10 Thunderbolt II (“Warthog”) was first commissioned in 1972. The service life has now been extended to 2028.